According to the results announced earlier this week, Zeynab Hosseini, Azizollah Movahedi and Morteza Shafahi have ranked first in the entrance exam for Master’s degree in geology, history and international relations, respectively. 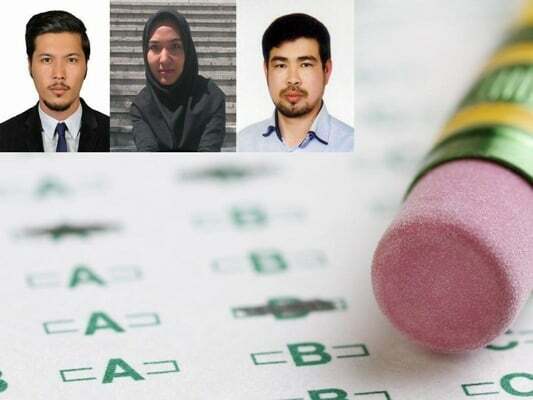 A Saturday report by Khabar Online said a number of other Afghan students have also obtained single-digit ranks and over one hundred have attained two-digit ranks. Iran has hosted one of the largest protracted refugee populations in the world, with the major refugee caseload being Afghans. Most of the Afghans fled to Iran either after the Soviet occupation of Afghanistan in 1979, or following the Afghan civil war in the 1990s and the US-led invasion in 2001. According to the latest information released by the Interior Ministry, nearly 4 million of the total Afghan population is residing in Iran, despite the voluntary return of hundreds of thousands of Afghan over the past decade. One million Afghan refugees are registered under the refugee registration scheme “Amayesh” and the remaining are undocumented or illegal residents. According to statistics by Iran’s science ministry, over 17 thousand Afghan students are currently studying at Iranian universities. Last year, Iran made it mandatory for public schools to admit all unregistered immigrant and refugee students. Education Minister Mohammad Bathaei announced last September over 370,000 Afghan students are going to school for free this year.